“This minimalist orchestral project is one of the most impressive large ensemble recordings that I have heard in quite some time. Jamie Baum - flute, Stephanie Griffin - viola, Laura Andel - composition/conducting. Music by Laura Andel recorded live by Elliott Sharp on October 25, 2002 in New York City. This CD also includes two other compositions performed by the Jazz Composers Alliance in Boston. 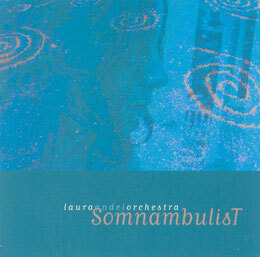 Somnambulist features three works by composer Laura Andel, whose music defies categorization since it draws from avant-garde jazz and modern ensemble music without hitting the creative pitfall of "third stream." The title track takes up 46 of the 56 minutes of the disc. Split into nine seguing sections, "SomnambulisT" depicts a night of troubled sleep. The music, richly arranged and heavy on creative textures, alternately evokes a state of dream and ritual music. After the loose "Entering," where the composer shows how she intends to lead her 13-piece orchestra into toneless tapestries, the accordion (Carl Maguire) announces the beginning of the "Procession." New voices are brought to the forefront in each segment, those of thereminist Pamelia Kurstin and singer Kyoko Kitamura being the most haunting, but in general this work leaves little room to individual musicians, focusing on (and succeeding in) developing an ensemble sound. The piece is not without its weaknesses (the ultimate "Waking Up," in particular, fails to conclude in a convincing way, although it can be seen as the evaporation of the dream). The two shorter pieces (four and six minutes long) feature the Jazz Composers Alliance Orchestra, a large modern jazz ensemble that has recorded some of Andel's compositions in the past. Shapes and figures are only sketched on "In the Midst," a puzzling arrangement of restrained outbursts. "Murmur" provides the highlight of the set: beginning with a tuba call that sounds like the foghorn that would naturally follow a track titled "In the Midst," it grows slowly into a drone lead by Rebecca Shrimpton's soft, soulful vocalizes. A bass pulse anchors the piece as it grows chaotically into its climax and then recedes. An interesting release.